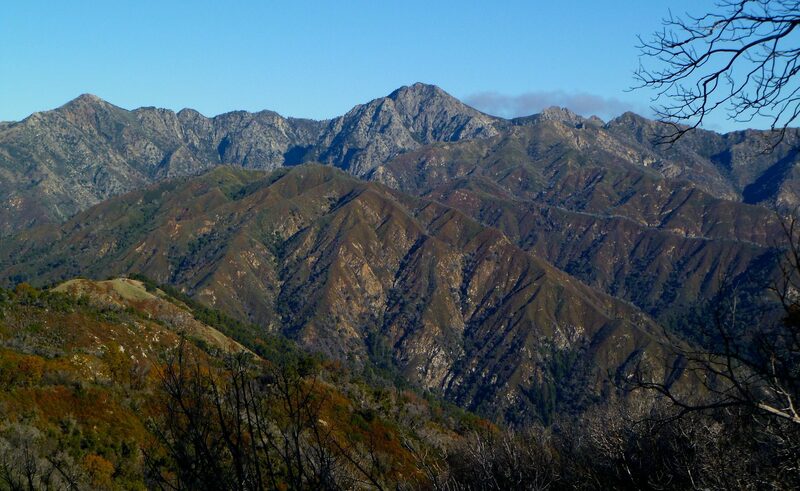 Where: Ventana Wilderness, Los Padres National Forest. When: Nov 12-14, 2010, repeated Nov 26-28, 2011 (3 days). 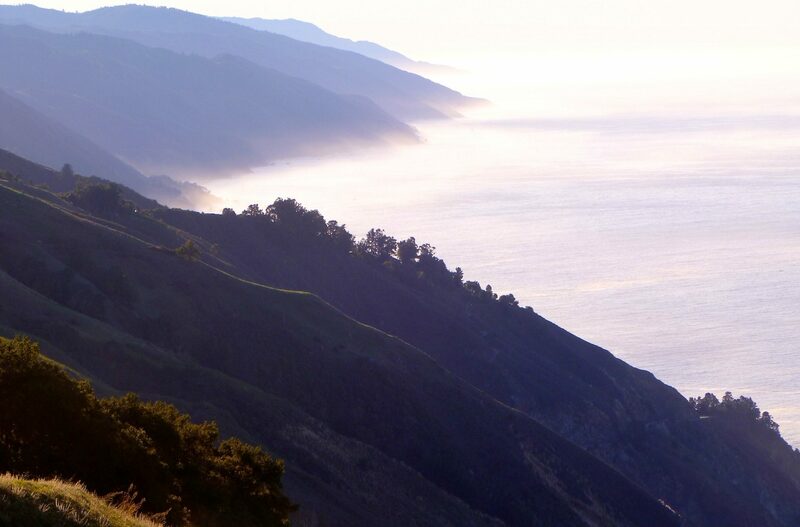 Highlights: Spectacular coastal ridge hiking and campsites, redwood groves, rugged terrain, solitude. 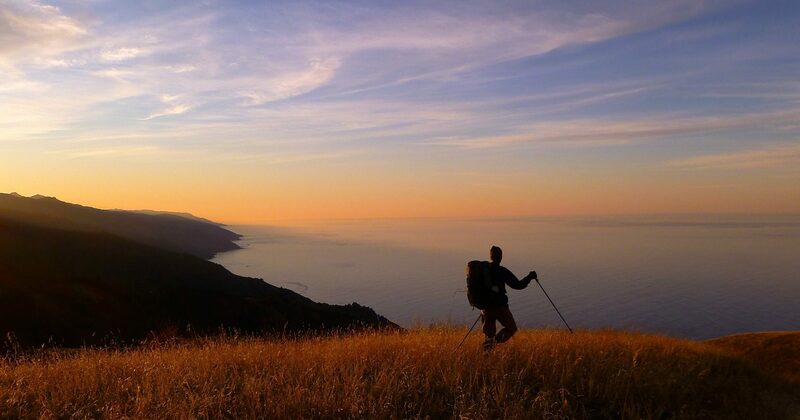 November is a great time to visit Big Sur if the weather forecast doesn’t include rain, so we often go there for a Thanksgiving backpacking trip. On this route, the logistics are easy as there is no need to shuttle vehicles or hitchhike back to a car. The Boronda Trail offers a magnificent view of the coast and there is significant habitat and scenic diversity. Although a portion of it is on the only crowded trail in the Ventana Wilderness, much is on trails that are rarely traveled so there is a good opportunity for solitude. Trails are not well maintained and it is critical to check current status at the excellent Trail Conditions Reports. 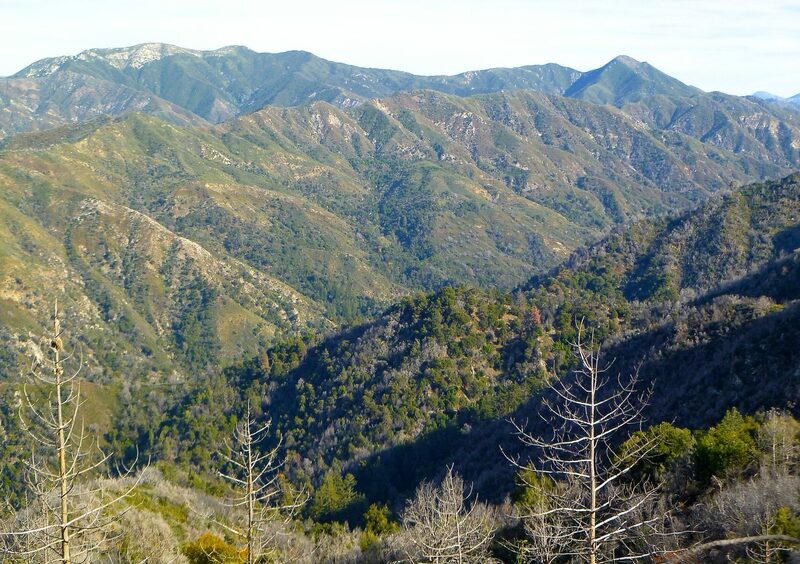 Check the Los Padres National Forest site for current status and restrictions. 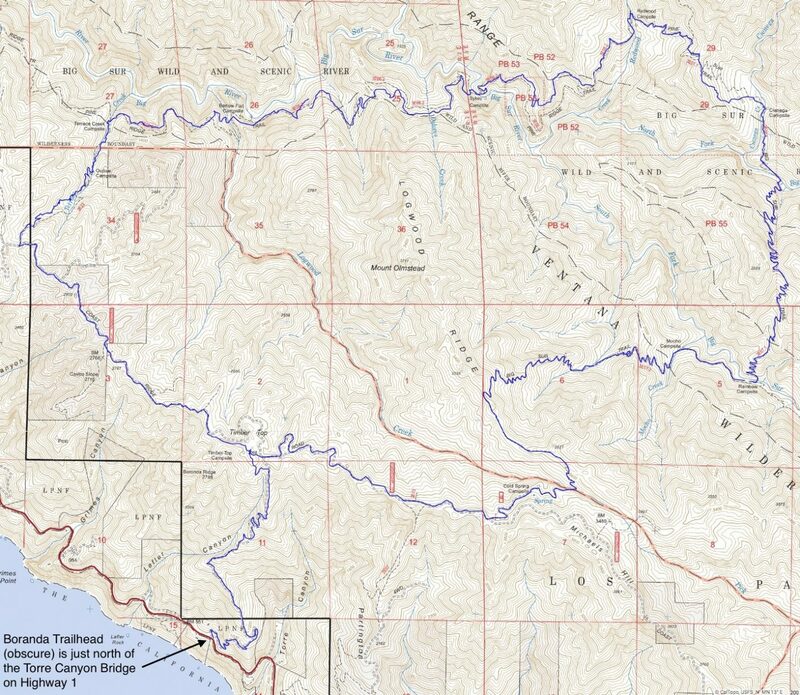 National Geographic Trails Illustrated Map: Big Sur, Ventana Wilderness [Los Padres National Forest]. Download a detailed USGS Route Map in PDF format, suitable for printing. Another not-so-obvious branch. Head to the right of the big oak to stay on top of the ridge, rather than heading left into the canyon. 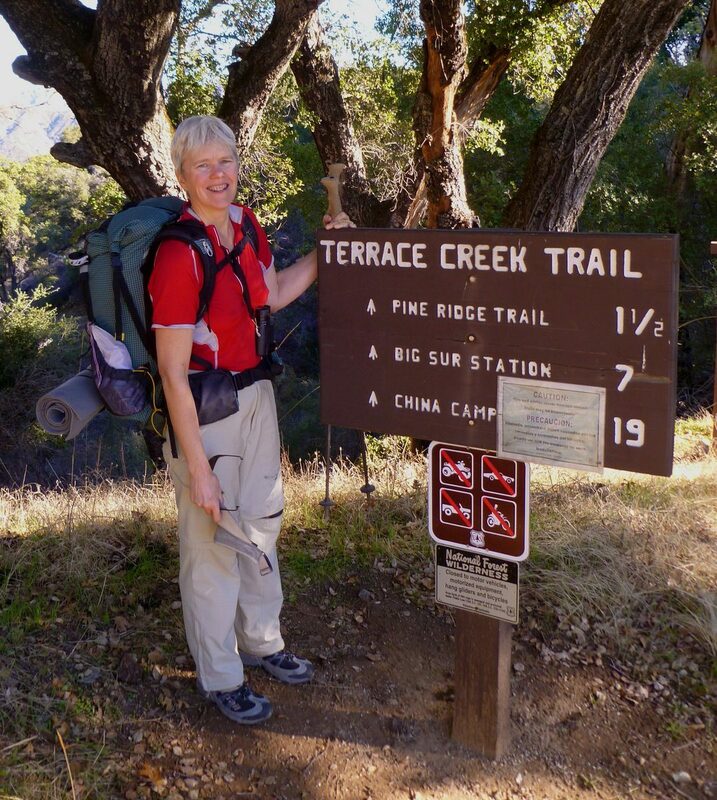 We descended into the Ventana Wilderness itself via the Terrace Creek Trail. 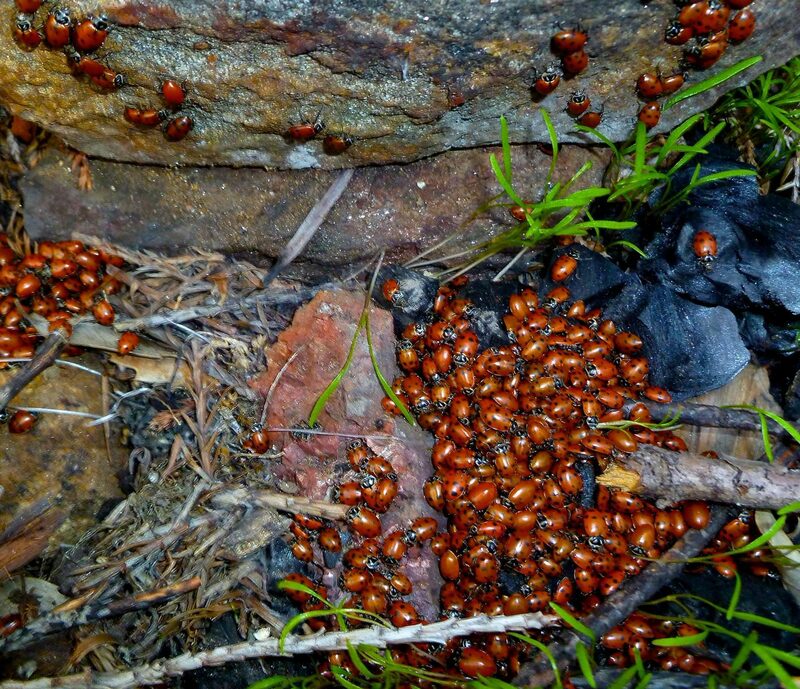 Ladybug colonies were found in many places on this trip. Heading back down Boronda Ridge Trail to the car. We had hiked most of the legs of this loop multiple times, and when James put it together in this configuration in 2010 I felt we had found a perfect 30 mile hike in Big Sur. On both of our trips (Nov 2010 and again in Nov 2011) we camped our first night at Redwood Camp and our second night at Timber Top, returning to the car early on the third morning. 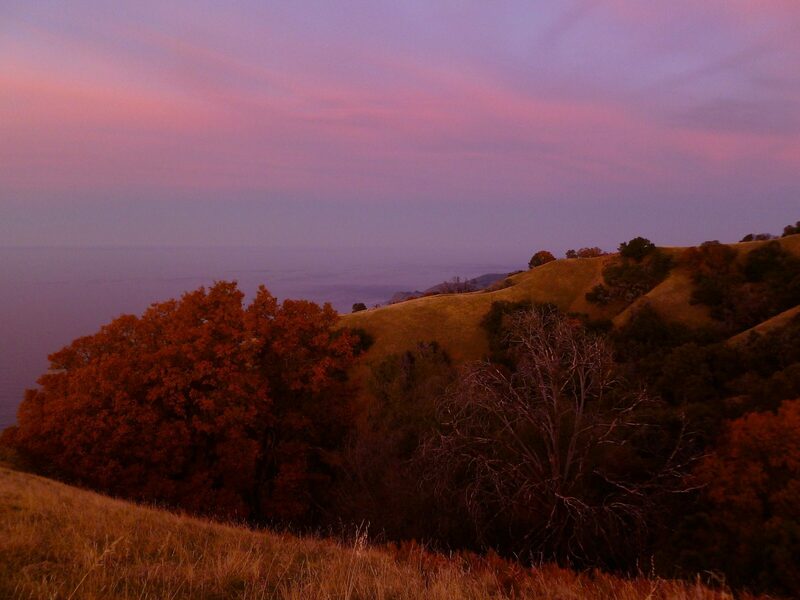 Redwood Camp is in a deep dark canyon sheltered by big redwood trees; Timber Top is open grassland with a spectacular 180 degree view of the ocean 900 meters below and two kilometers distant. I deeply appreciate the extreme contrast in habitat and scenery. 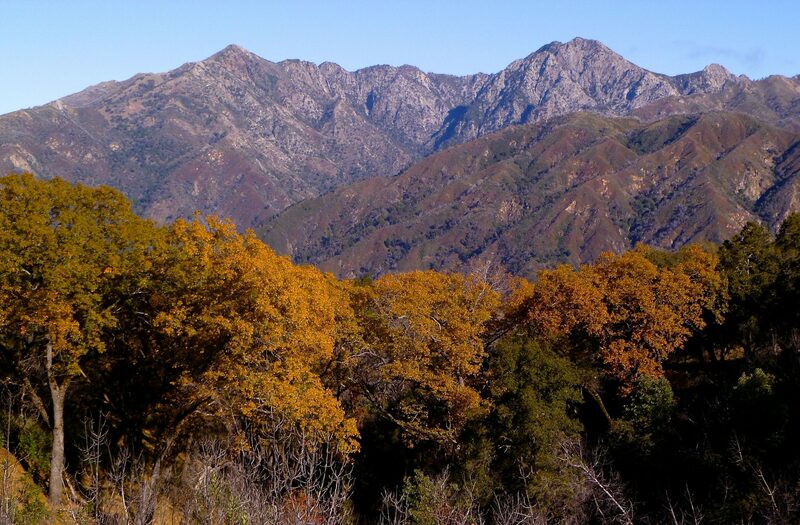 Ventana Wilderness is a special place with world-class scenery and biological diversity, but the USFS has had almost no budget for trail maintenance for many decades. It is a tragedy that the extensive network of trails is being lost. 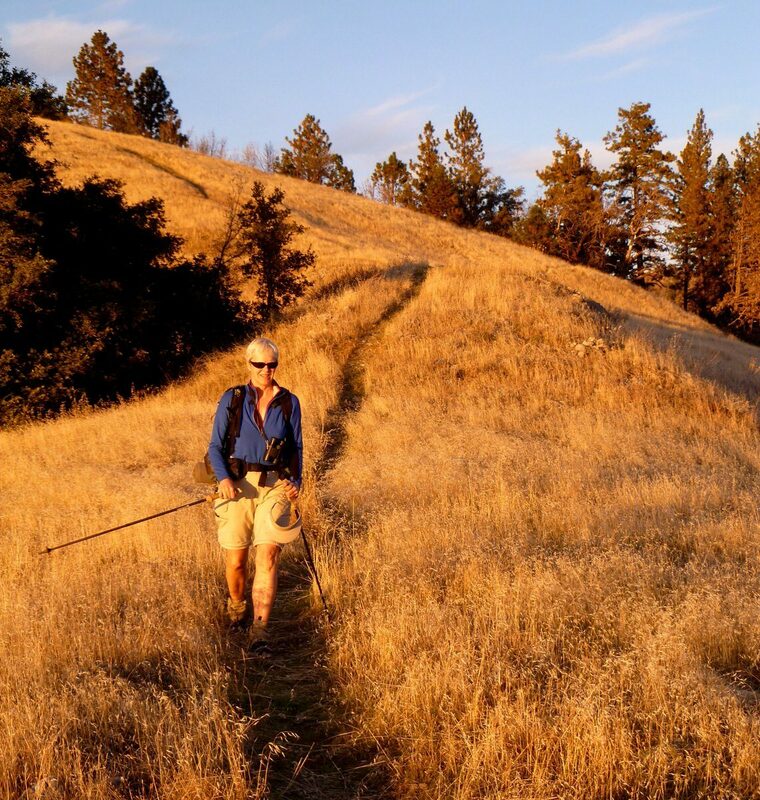 One single stretch of trail gets over 90% of the use and it has lost its wilderness quality. Meanwhile the remaining trails decay, become impassable, and eventually are entirely lost. I can not say enough good things about the exceptional work being done by the Ventana Wilderness Alliance to protect the region and preserve the trail network. The terrain in Big Sur can be surprisingly challenging so for me the walking is usually rewarding. The place really feels wild and is remarkably empty of other people and I enjoy the solitude. 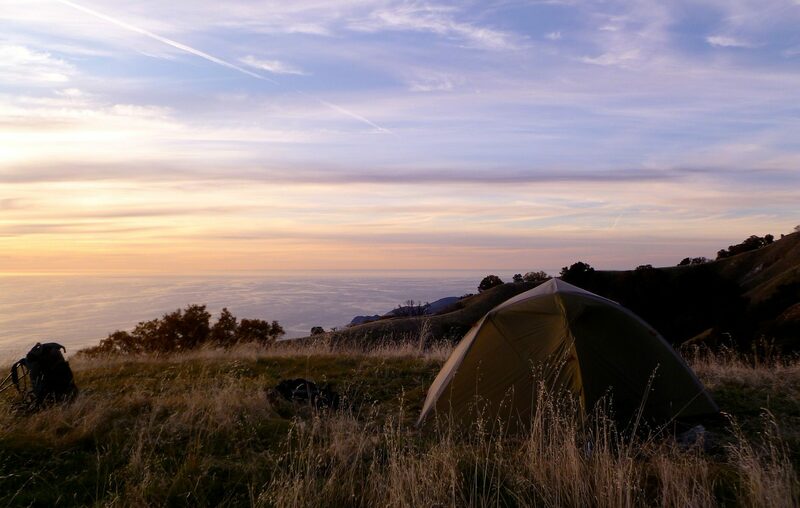 Camping along the coast ridge is as spectacular as it gets anywhere. 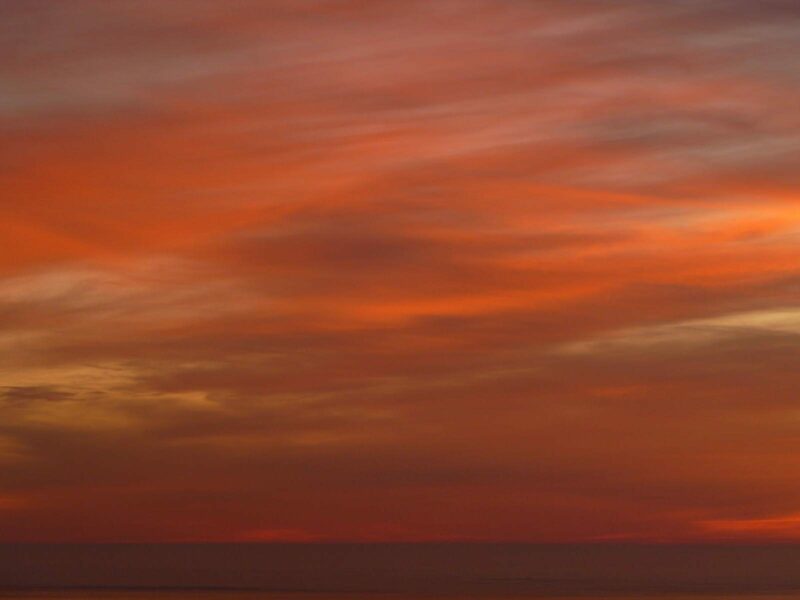 A green flash frequently accompanies the sunsets seen from high over the Pacific. 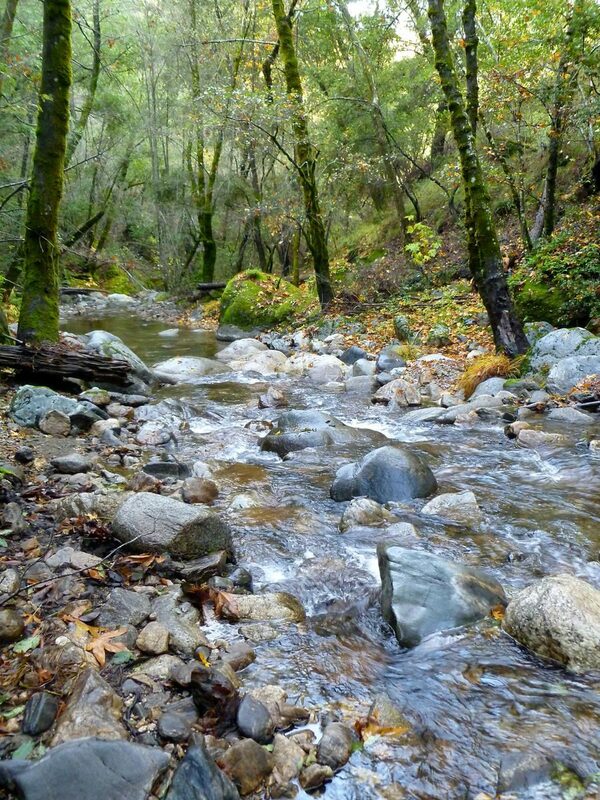 I enjoy this particular walk because it has so much variety for a short hike: coastal vistas from open and hilly grasslands, deep canyons with redwood trees, chaparral covered ridgelines, and shady tan-oak woodlands. This region burned in the massive summer 2016 Soberanes Fire. Then the 2016-2017 rainy season dumped record rain on the region and there was extensive damage to trails. The Terrace Creek Trail and Pine Ridge Trail portions of this route are currently closed to the public until further notice. 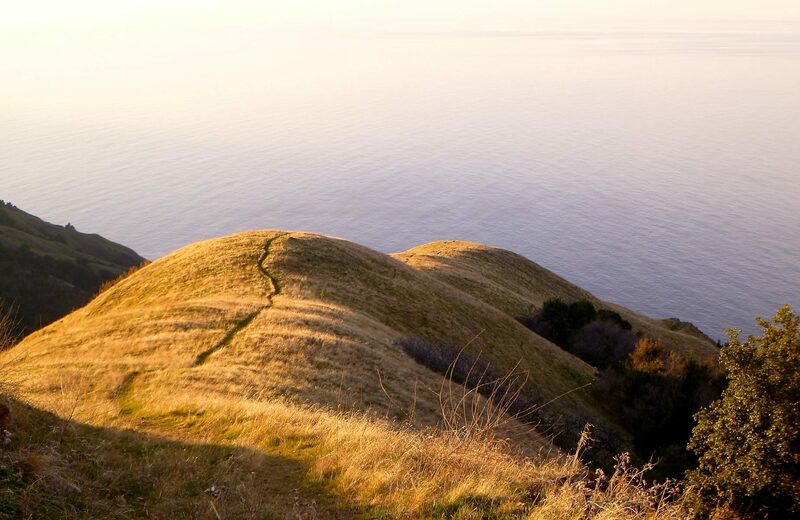 The Boronda Ridge Trail and Coast Road portions have been reopened. The parking area for the Boronda Trail is simply a wide shoulder on highway 1, with room for several vehicles. There is no sign indicating that there is trailhead parking, but there is also no sign indicating that parking is prohibited. The trailhead is 0.7 miles northwest of the Torre Canyon Bridge on Highway 1. To find it, either use a gps device or the bridge your reference point.. 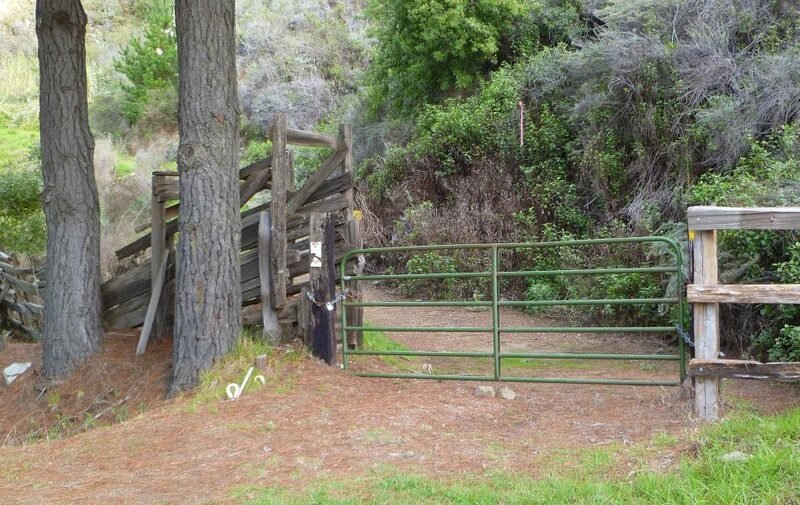 The trail starts at a green metal gate next to a decrepit wooden cattle shoot, as shown in the photo. In terms of weather the route is accessible year-round, however some seasons are more favorable. June through August is generally uncomfortably hot and flies can be a real problem. April, May, September and October are almost always excellent. November through March can be rainy, especially December through February. A winter storm will often drop over five inches of rain on the coastal range. Snow is unusual but possible; it is highly unlikely to accumulate anywhere on this route. The route is fine in a clear weather window in winter, so if you can adjust your schedule based on the forecast then winter is a great time to visit; expect daytime temperatures in the 50s and frost at night. Boronda Trail (aka Timber Top Trail) from Highway 1 to the Old Coast Ridge Road, 3.1 miles, up 2600′, down 200′. This trail starts at Highway 1 does not have any signs or waymarks. Ascend a graded dirt road for 0.7 mile to a junction at the start of a 180 degree left-hand switchback. The graded road continues straight to service a private in-holding and the Boronda Trail veers left; complete the switchback and continue climbing. Climb the ungraded dirt track to Timber Top. You will encounter several junctions with old ranch roads or cow paths; use a gps or use common sense to stay on the track that continues to climb a grassy ridge top. 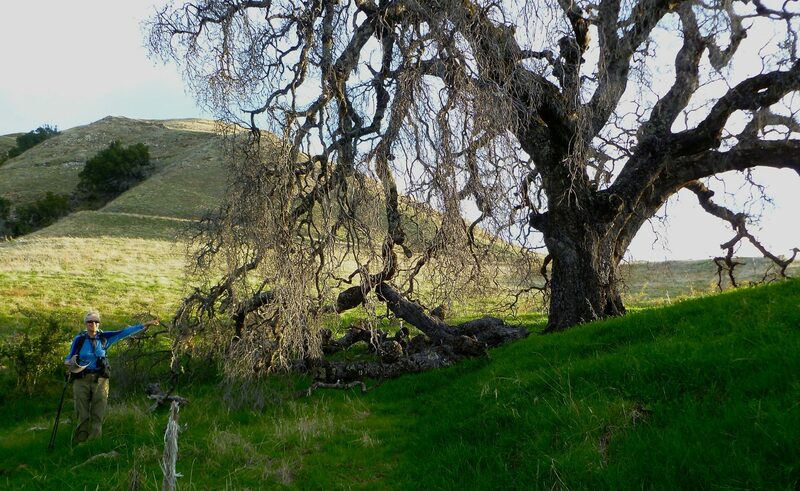 2.8 miles from Highway 1 you will reach the excellent old Timber Top campsite at 3068 feet. There was once a picnic table here but it burned years ago in a wildfire. Unless it was destroyed in the 2016 fire, you will also find an old corral. From the campsite continue a quarter mile west to the junction with the Coast Ridge Road. Coast Ridge Road to Terrace Creek Trail junction, 2.2 miles, up 400′, down 700′. Prior to the completion of Highway 1 in 1937 this was the main road. It is graded dirt and provides access to several in-holdings and there is a chance that you will see a vehicle or two and you will pass a couple buildings. 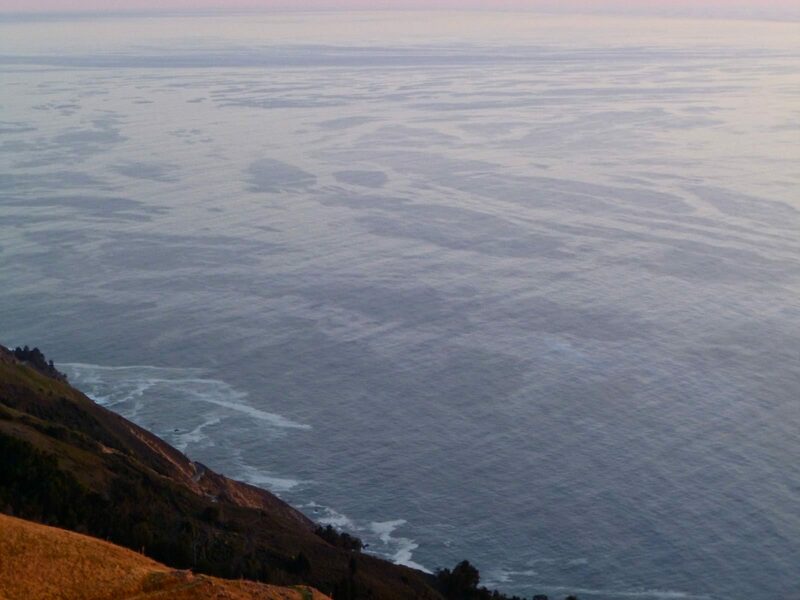 There are great views southwest over the ocean and northeast into the Big Sur River canyon. There are good camping options along the west side of the road as an alternative to staying at Timber Top. This road was a fire line in the 2016 Soberanes Fire. Terrace Creek Trail from Timber Top Trail to Pine Ridge Trail, 1.4 miles, up 300′, down 2600′. Prior to the 2016 fire there was a trail sign at the junction, but it may be gone now. Descend until you reach the junction with the Pine Ridge Trail. Terrace Creek Campsite is here. Pine Ridge Trail from Terrace Creek to Sykes, 4.1 miles, up 1200′, down 1500′. This is the main route to the very popular Sykes Campsite and is the most heavily used trail in the region. The trail is usually very well maintained. If you like privacy, avoid camping at the Terrace Creek, Barlow Flat, or Sykes campsites as they are heavily used. That said, the terrain is very steep and unless you are using a hammock other viable camping options are extremely difficult to find. Sykes Campsite has a hot springs and is a major destination for backpackers, some of whom bring dogs, alcohol, music and such. 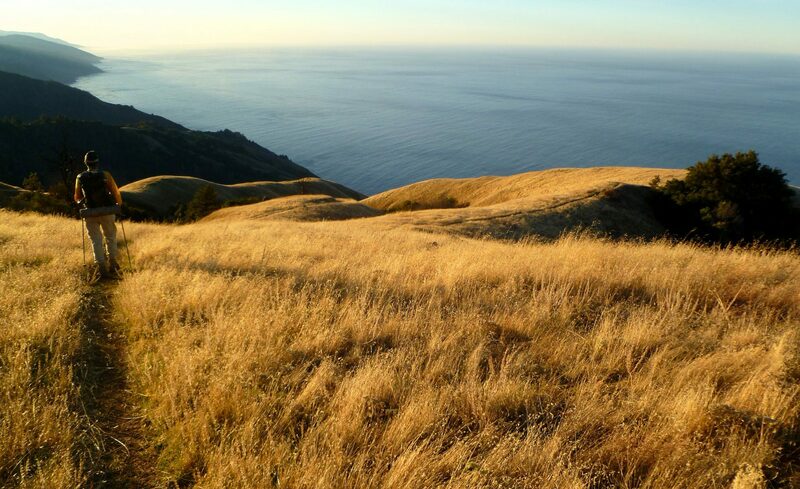 Continue on the Pine Ridge Trail from Sykes to the Big Sur Trail junction, 3.0 miles, up 1600′, down 300′. Very few hikers continue past Sykes. 2.4 miles after leaving Sykes the trail crosses Redwood Creek where there is a campsite; we’ve always used a large flat place on the east side of the creek. 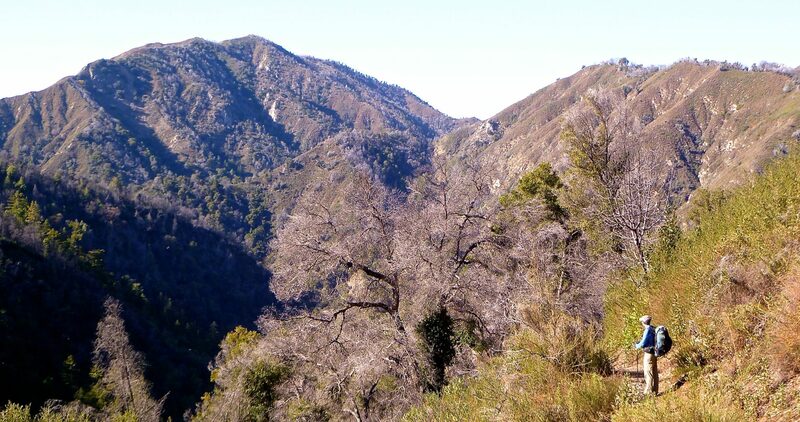 The junction with the Big Sur Trail is 0.6 miles east of the Redwood Campsite. 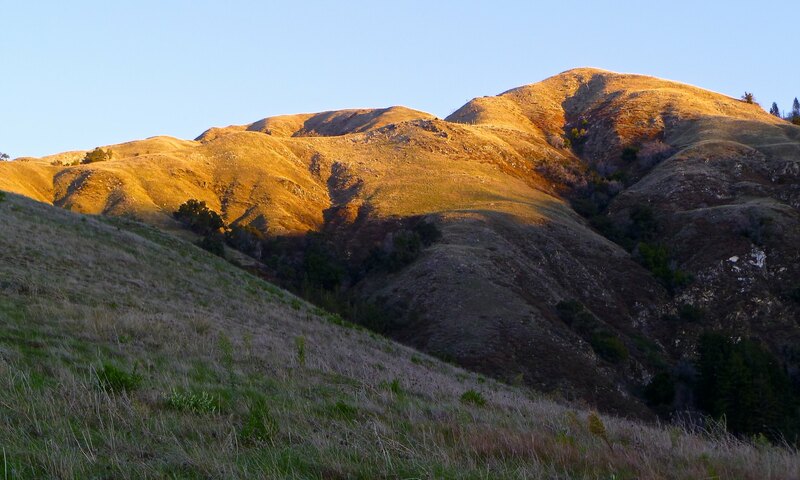 Big Sur Trail from the Pine Ridge Junction to Rainbow Campsite, 4.0 miles, up 1400′, down 2200′. Prior to the 2016 fire this piece of trail had not been cleared for years and was very overgrown in places. We have always been able to follow the tread, but keep in mind that we’re willing to bash a lot of brush before we get frustrated. Be sure to read the trail conditions reports so you know what to expect. At Rainbow Camp there is a junction with the South Fork Trail, which we tried to take in 2010 but we turned back after 2.5 miles as the trail was obliterated by brush and downed trees. A work crew cleared the South Fork Trail in May of 2016 and we look forward to exploring the area again. An optional side trip to South Fork Campsite, 1.3 miles southeast of Rainbow Campsite, passes through a wild and beautiful river canyon. From South Fork campsite you could continue southeast and leave this particular loop; this had been our intention in 2010. 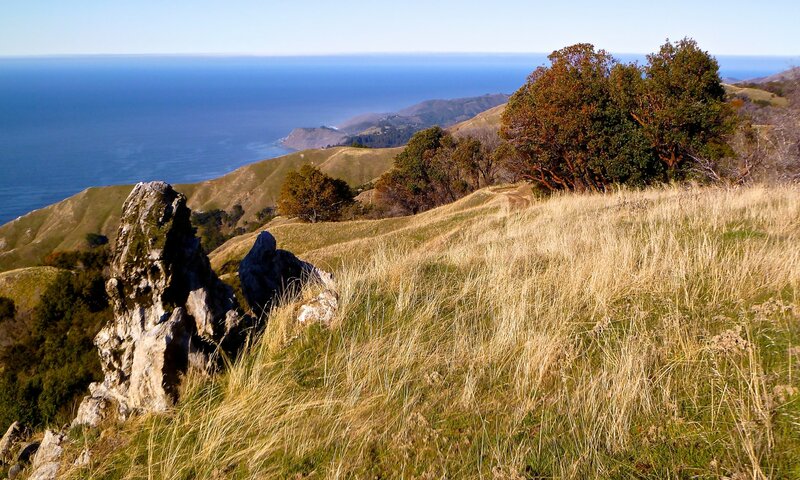 Continue on the Big Sur Trail from Rainbow Camp to the Coast Ridge Road, 5.0 miles, up 2700′, down 900′. 4.2 miles after leaving Rainbow the trail crosses a drainage which has pools of water in winter and spring. A quarter mile after you cross the drainage you acquire a graded dirt road at the old Cold Springs Camp. That camp is now a 20×50 meter bulldozed zone used as a heliport and fire staging area and is not an attractive place to camp. About 100 meters west of the bulldozed zone is a spring-fed water tank, which may or may not have a spigot. A half mile past the water tank is the junction with the Coast Ridge Road. North Coast Ridge Road, 2.3 miles, up 300′, down 600′. Follow the road to Timber Top. The road has a major loop as it skirts the north side of Timber Top, very visible if you look at the map. Take an easy shortcut as shown on the map. 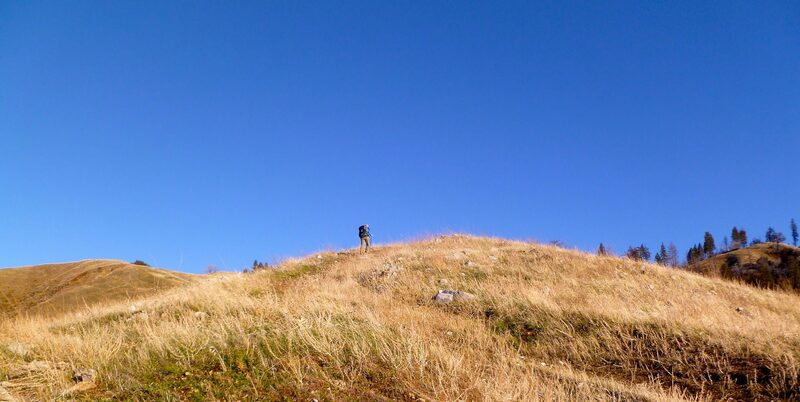 To find the shortcut, either use a map and compass or a gps device. 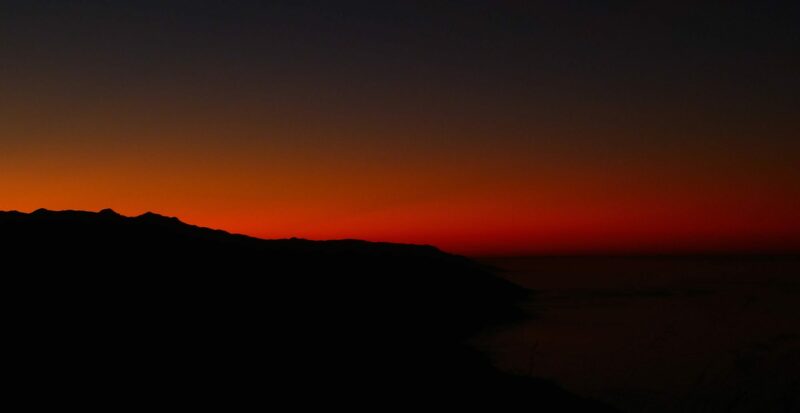 We like to spend our second night at Timber Top in order to enjoy the fantastic sunset view of the ocean. 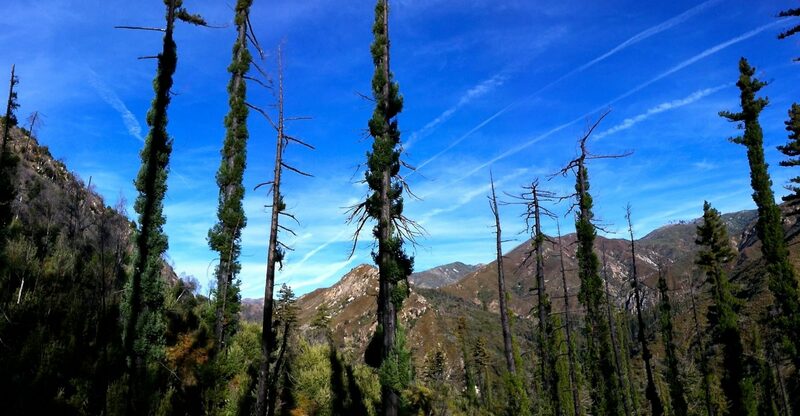 Descend the Boronda Trail to Highway 1, 3.1 miles, up 200′, down 2600′. Disclaimer: Do not rely on our exact tracks for your route; use skill and common sense. Some of the tracks used in our map were imported from other sources, and some we drew based on satellite images and USGS data. In all cases our lines may or may not follow the exact trail tread. Since the trails can become overgrown it is imperative that you use your own skill to stay on the trail. Use the stated distances as guidance; various sources of trail distances rarely agree. The Forest Service usually prohibits campfires in this region, and often imposes restrictions on the use of stoves. Always check on the current status if you intend to light a match on your trip and for goodness sake don’t be the fool who ignites the next wildfire. The Soberanes fire was ignited by campers and was the most expensive firefighting effort in US history. Poison Oak is abundant in some areas. Trail conditions change from year to year. Dedicated volunteers do their best to keep trails passable, but winter storms cause landslides; fires allow sunlight to reach the under-story promoting rapid undergrowth; downed trees can pose a serious obstacles due to very steep terrain. We recommend checking current trail conditions before every trip. Nice pictures. One day I’ll get out to California to hike. Did you see snakes? Last time I hiked down there I saw several.